Colorado native Ben Stookesberry, one of the great adventure kayakers of our day, has stated that the Black Canyon gave him his first real taste of expeditionary kayaking. What more is there to say? In a state with an excessive number of roadside runs and dearth of stretches of difficult whitewater worthy of a multi-day expedition, the Black Canyon holds a special place in the heart of many boaters. Paddlers who seek the Black Canyon solely for its whitewater will be disappointed, but those who seek challenge and adventure will long to return. A trip down the Black Canyon starts high above the rim at the visitor’s center for a required check-in with the ranger on duty. While at the rim, the temptation is irresistible to hike to the rim with the tourists and peer over the edge into the blackness hundreds of feet below (2722 ft at its deepest point). In less than 24 hours you’ll be dancing with the Precambrian rock as the Gunnison River cuts through this massive incision in the earth, and staring upward at the impossibly tall rock walls of gneiss and schist. A relatively small number of people have ever ventured into the canyon’s depths. The adventure begins below the Crystal Dam located at the south side of the canyon. Enjoy the river access here because it’ll be one of the few easy aspects of trip. Looking downstream offers a glorious view of the giant crack in the earth that awaits your arrival. As the river enters the canyon, the action begins and the character of the river quickly reveals itself. Good quality whitewater is constantly marred by dangerous sieves and undercuts that seem to permeate every nook and cranny of this river bed. Day Wrecker, the first class V rapid, might look good until you check out all the water flowing under rocks just downstream. I personally witnessed one of the most scary swims I’d ever seen at Double Drop when a boater flipped in the entrance and his boat almost completely became engulfed by the bus sized undercut boulder on river left. The boater disappeared entirely under the rock, only to resurface a couple dozen long seconds later in the pool downstream of the boulder. These stories are more common than you’d like them to be. As you descend further into the heart of the canyon, the white water starts to get good. Milo, the unofficial kayaking curator of the Black Canyon, would likely describe the rapids in this section as mostly class IV+++++....with.....some...III+++++....in.....between. What’s with all the +’s? It’s what’ll happen to you if you miss that class III move. After several quality rapids, the river pools up above the iconic 15-18 foot waterfall. Boof hard to the left to avoid a rock in the landing zone that has broken ankles before and be cognizant of the sieved out boulder downstream of the river left eddy you land in. At this point, you’ve likely decided that the whitewater is just going to get better and better. Unfortunately, the water starts going underground and thus begins an arduous portage through car sized boulders and 6 foot tall poison ivy plants. In 1997 a group that included the famous Kern Brothers attempted to run portions of this section that is typically portaged. Chuck Kern was caught in an almost invisible sieve and died on the river. As far as I know, nobody has attempted to run this section since. As if the boulders in this mile long portage were not sufficient obstacles, some of the healthiest poison ivy plants in the world reside in this deep portion of the canyon. Had anyone ever told me that I would intentionally walk directly through a giant thicket of poison ivy, with leaves rubbing across my face as I went, I would have told them they were absolutely crazy. However, that’s exactly what I did. Fortunately, boaters have figured out lots of techniques to deal with this insidious plant. Chief among them is soaping up any exposed skin before the portage so the oils can be easily washed off in the pool below (hot tip: don't soap above eye level). Milo has even dialed in the brand and color of the dish soap that’s most effective. The reward for huffing your boat through a sweaty hell is one of the most beautiful camps I’ve ever experienced. There is one large natural cave with a sandy floor and several smaller ones that provide ideal shelter from the elements and potential rock fall. On a clear night you can spend hours admiring the reflection of the moon on the massive rock wall. Even though the visitor’s center lies not far away on the rim above, the inaccessibility of the canyon at this point makes civilization feel very far away and solitude the dominating sensation. Doing the entire run in a day is completely reasonable, but in my opinion, spending the night in the canyon is one of the main reasons to experience this run. After the cave camp, there is additional portaging after crossing the river. A seal launch back into the river offers a brief jaunt in the boat until Next Generation, a stout rapid that has been run with more regularity in recent years, but demands a high level of respect. Several more quality drops remain, as well as an additional portage at Great Falls for all but the most wild of the wildest boaters. Some boaters run just the last waterfall but the technical entrance and tight landing make even that a daring proposition. Several more fun rapids await, but know the lines and the hazards before bombing downstream. Eventually the canyon opens up and the character transitions back to class II until the takeout at Chukar trail. The key to enjoying the hike out of Chukar trail is to avoid the heat. If the clouds are out and it’s not the height of summer, most people enjoy finally having a real trail to hike out on, rather than boulder strewn river banks choked with poison ivy. 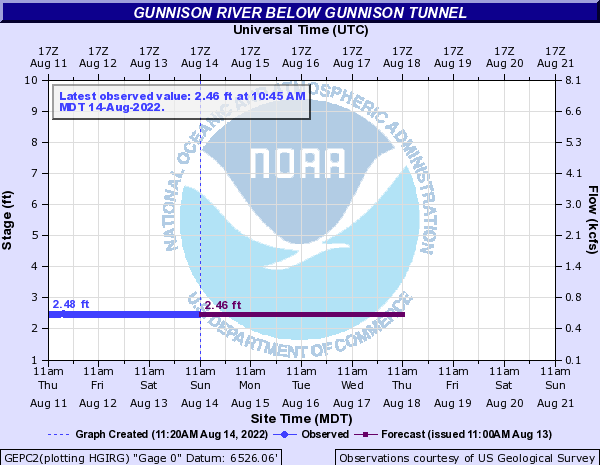 Some people looking to extend their time on the Gunnison will boat another day or two through the class III Gunnison Gorge below the Chukar trail. Some, worn down from hiking their boats and mentally exhausted from dodging sieves and undercuts swear they’ll never come back, but humans have short memories, and once the poison ivy itch subsides, the itch for another adventure down the Black begins. This rapid feeds into a hole that is difficult to clean and has many bad sieves looming below it. Just as the name implies, this rapid has two relatively straightforward ledges back to back. Be very wary of the bus sized boulder on the left after the first drop. I've personally witnessed a very scary swim. The boulder is so undercut an entire person passed through it, and all but a foot of their boat was engulfed by it. This is one of the more fun moves on the run that involves making a left to right move and boofing a ledge above a squeeze between two large boulders. The boulder on the right appears to be fairly undercut, but doesn't seem to cause a lot of significant issues. This drop has a marginal line at best, and most people consider it a mandatory portage. Like many rapids on the run, the line is fairly straightforward, but abundant sieves and undercuts mean that cleaning the move is mandatory. Shortly after the portage comes an impressive series of drops known as Next Generation. As far as I know, Tom Janney and Christian Cook had the first descents on this rapid in the mid 2000s. After their descents, it's run with more regularity, but has also dished out some serious carnage. I would consider this one of the largest runnable rapids in the state. Black Canyon from KSC on Vimeo.